Nelson Mandela Metropolitan University (NMMU) has its first television advertisement – and it’s entirely home-grown. From the production crew and actors through to the locations and voice over, the 30-second advertisement which is set to flight on national television in April, is a proudly Eastern Cape production. Even the accompanying music was especially arranged by a Port Elizabethan. “We’re thrilled with this advertisement and how it’s going to position Nelson Mandela Metropolitan University nationally. The university has over the past 2 years grown in national stature, but we need to further create awareness,” said NMMU Director of Marketing and Corporate Relations Pieter Swart. The advert also includes the voice of international actor John Kani, who still calls New Brighton home and is an NMMU honorary graduate. The music is by Ethan Rank, a former NMMU music alumnus. “The music and John Kani’s voice adds the gravitas NMMU needs in sharing its brand beyond the Eastern Cape,” said Mr Swart. Unlike traditional university advertisements, NMMU opted to appeal to people’s emotions in sharing the “moment” when you turn dreams into reality. All five locations are in the Eastern Cape, two within the university. The university worked with strategic brand agency Boomtown and production company Rooftop, whose teams include a large number of NMMU alumni. “This TV advert was a great opportunity to show our production capabilities and what Nelson Mandela Bay has to offer. I think our city has a lot to offer the film industry and this was the perfect opportunity to show it to the world,” said Rooftop’s Richard Ahlfeldt, a former NMMU student. Similarly, Boomtown’s team is almost entirely made up of NMMU alumni. “It has been a fantastic journey working on this project. From concept, to pre-production, production and final editing, every component has been initiated entirely in and around Nelson Mandela Bay, and using local skills, and expertise,” said Boomtown’s Andrew Mackenzie. Though the actual filming probably only took five full days of filming at the different locations, the final product took months of editing to ensure it captured the essence of prospective students making that bold decision in realising their dreams and aspirations by joining the university. The decision to use home-grown talent is one already followed by the university, which gives its own students the opportunity to model for its marketing materials and publications. 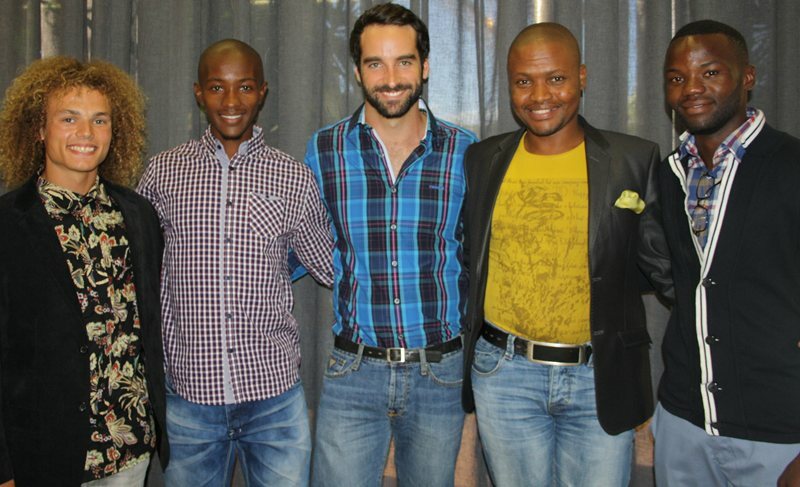 All the actors, bar schoolboy David Spanjaard, are NMMU students or staff. “Using our own students makes the final product so much more real,” said Mr Swart, adding that the television advert was part of a much bigger brand-building campaign that includes radio, newspaper and magazine, social media and billboard advertising. COMMERCIAL STARS … Nelson Mandela Metropolitan University students (from left) David de Villiers, Thando Loliwe, Louis Zietsman, staff member Morris Matyila and Kuda Maybhonga all appear in NMMU’s first television advertisement. A complementary viral marketing campaign meant that X number of people had already seen the NMMU advert with will run for six weeks, and then for a further six weeks from mid-year. Viewers should immediately recognise the Opera House, Coega headquarters and Die Watergat in Jeffreys Bay. The aspirant politicians’ scene was shot in the university’s South Campus Auditorium and the athlete’s race at the NMMU stadium at night. In fact, half the advertisement was filmed at night and the majority in slow motion with high tech equipment. Article issued by NMMU. To visit their profile on SAstudy, click here.